#1 Who are you and How would you describe yourself? My name is Ben. I’m an Australian living in Edmonton, Canada right now. I left my home for the first time in 2013 and since then, I’ve visited more than 50 countries. I decided to start a travel blog, Horizon Unknown to help others find their love for travel. #2 What got you into travelling? Living in Australia for the first 23 years of my life. Every day began to seem the exact same as the previous day. I felt like I was stuck in a rut, that I could only get out of by leaving the sunny shores of home. So I jumped on a one-way plane to Ireland and eventually all of Europe. #3 What is your favourite destination in the world and why? This is probably the hardest question to answer, but I would have to say Japan. I travelled through this historical a and quirky country for 3 months in 2017. Apart from jumping from hill to hill snowboarding the insane amounts of powder, I found out ramen is by far my favourite meal. #4 What sort of a traveller are you? Usually, I class myself as a budget traveller. Hopping from hostel to hostel, cooking my own meals a lot of the time. However, I will splurge if there’s an experience I feel like I need to have. I also tend to travel quite fast and fit as much into my limited time on the road as I possibly can. #5 What’s your most memorable experience during your travels? While I was travelling Bosnia and Herzegovina, all the way back in 2013, I went on a hostel organized tour. My driver for this 12 hour, non-stop tour was Bata. He took a small group of us around the lesser known sights around Mostar in a white van, few us and gave us more rakia (homemade plum spirit) that I could drink. It was my favourite tour I’ve ever taken. Like reading such Inspirational stories. #6 Your take on responsible travel? Responsible travel is super important. Not only to ensure there are beautiful places to travel and explore for further generations, but respecting the local customs and traditions. When I visit a different place, I aim to leave it better, or at the very least, not worse than I found it. This means I’ll despise of all my garbage properly and try and pick up other people’s if I see any. As well as interacting with locals, a quick conversation, or even just a genuine smile are little things that add up to more fulfilling travel. #7 How do you sustain your travels? To sustain my travels, I usually work for 3-6 months and save up as much as I possibly can. Usually, around 4 months of solid work can give me a year of backpacking. My travel usually finishes when my money runs out and return to Canada to work more. #8 How do you manage your budget during your travels? I try to keep a daily budget of what I spent on what, and then add a monthly total up. Every time I travel for a long period of time, I get a little better at keeping it up to date, but I’m far from perfect at it. #9 What’s the best thing you have eaten and where? Usually, when I travel, I like to try every food and drink at least once. That means I’ve tried a lot of things I will never look twice at again. But my favourite dish is ramen, I had way too much of the meal while I was in Japan. I stood in line for around an hour to get a seat at the world’s first Michelin Star ramen restaurant, Tsuta. While it was quite a bit more expensive than the cheap meal usually costs, it was well worth the one-off experience. My favourite airport has to be Seoul’s Incheon Airport. Not only do they conduct free transit tours to the city for those with long stopovers, but they also have free hot showers and arts and crafts while you wait. For my worst airport story, hands down my 50+ hour transit day through Nanjing Airport. Border officials took every foreigner’s passports for around 3 hours (still not 100% sure why), the original plane broke down so we wait half a day in the airport not being allowed to leave. On top of all that, I got pretty bad food poisoning from the food provided for us by the airline. I’ve never been so happy to be at home in bed! #11 What tip would you like to give to fellow travellers? There’s a lot I could say for this one, but I think keeping a travel journal is the best thing I’ve ever done. It can be such a chore to write for an hour when you’re exhausted, but a year or ten later, you’ll always be able too to look back and relive those memories. It’s well worth the effort. A great post and one that inspires travellers like myself and many others to try and explore. Fascinating story about all the travels and interesting to know that japan was one of the highlights and must astonishing destinations of all travelled. Habe taken a lot from this post and will use it in my travels and life. Thanks both for this great interview and keep travelling. Reading about Ben’s journey and knowing that he has visited 50 countries is really inspiring. I hope to hit that number too someday.I relate to him when he says that he travels fast to fit in to limited time periods. I am always having short trips and I am always looking forward to experiencing as much as possible. It’s good to know more about travelers and what’s their experience in traveling. I find it refreshing. I love his photos! They are amazing! It’s never easy migrating from one country to another so I really salute him. 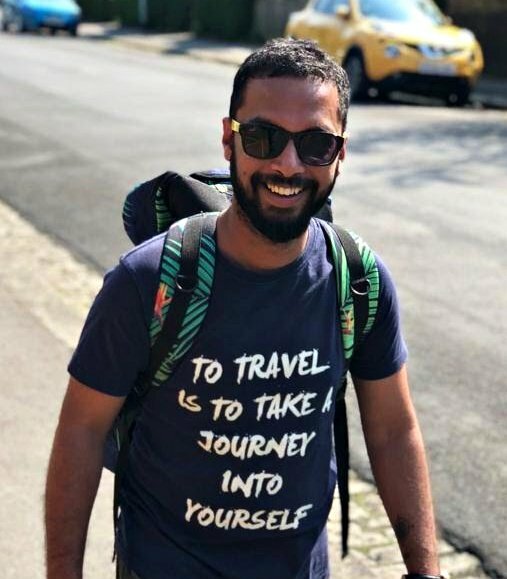 It’s always interesting to read what’s other bloggers’perspective on travel. I know a lot of people who work part of the year and then travel the rest of the time. I never kept a travel journal, but I consider my blog to be kind of a travelogue. A great interview series. I enjoy reading about adventures on the road. The day trip to Bosnia sounded a lot different to the one I did, I think I would have preferred this one. Now, I want to visit Tsuta and have ramen. Thanks for sharing. That’s a great step that you had taken – coming out of the same regular life and do what you like now. You are living the life, Ben. It ain’t easy to shift from Australia to Canada, but you made it sound like it’s really cool. I am happy to read how to save money and travel, intermittently in a year. Great going! Australia to Canada is a big change, what an amazing place for home base. Sounds like a great budget traveler to follow for tips and tricks. Gorgeous Instagram photos from all his travels.